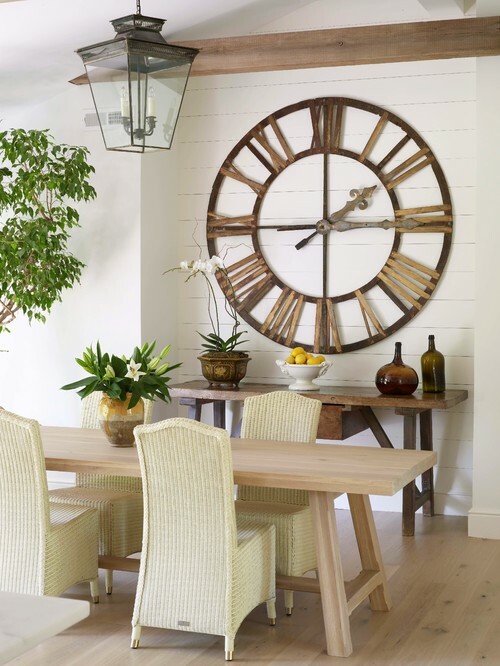 On average an interior design trend has a lifespan of about 10 years before people get bored and are ready for change. There are the early adapters, those that act on it mid-wave, and then those who catch the tail end. Trends also tend to begin on the coasts and then filter inland, which means that there may be a few year delay on a trend catching on or ending nationally. With that being said... who doesn't love gray? It's everywhere right now and has been for the past 6+ years. It's so easy to match, is modern, and can be used with warm or cool toned interiors. 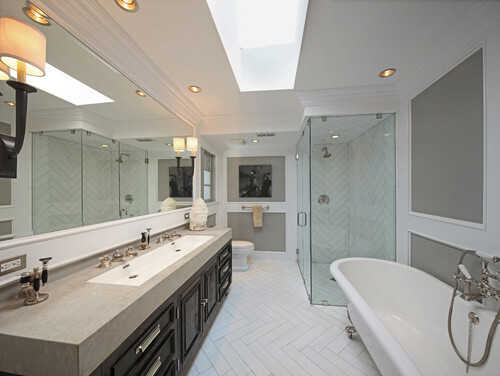 Anyone who has done a recent kitchen or bath renovation has most likely installed gray and white toned vanity, counters, backsplash, etc. 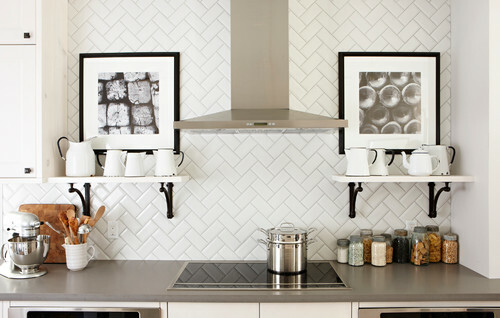 And gray matched with white subway tiles is a classic look that can go either industrial chic or Scandinavian minimal. Gray used in a living space is modern and can create a soothing monochromatic color palette. Below are three examples I pulled from the front page of Pinterest today. But I've often wondered what all this grayness will look like in a few years and I've dubbed it "recession renovations". Yes, the fact that we've been slowly digging ourselves out of the worst economy some of us have ever seen had taken it's toll and left home buyers to either put projects on hold, or make super "safe" decorating decisions. I don't think it's any coincidence that people find using gray a safe, yet trendy choice. As the economy is improving though, people are feeling more optimistic and are willing to embrace change and even a little more risk. 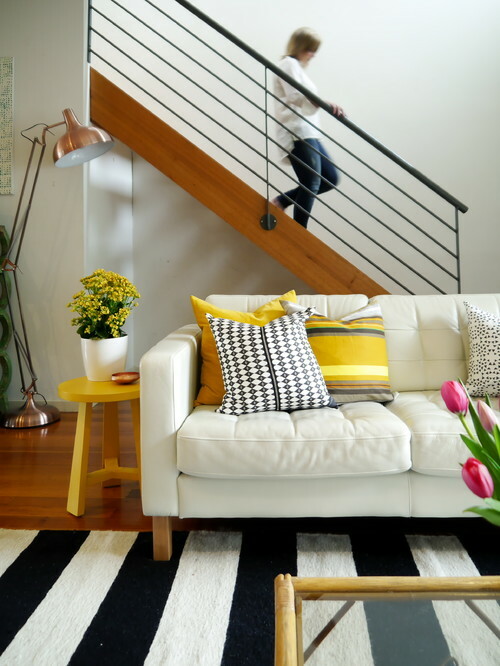 Optimism is often expressed through color and it seems designers and homeowners alike are getting ready to embrace color again this year! No more drab outlook, no more drab interiors. "Oh great" you say? You just installed a gray "whatever".... Hey, it's no problem at all! Gray is a great neutral base and will help transition your home into the next phase with color. You can start adding layers of color to bring the room to life with accessories that are always easy to change out. If you're about to embark on a renovation or new purchase and have always loved color - now is your free pass to indulge! 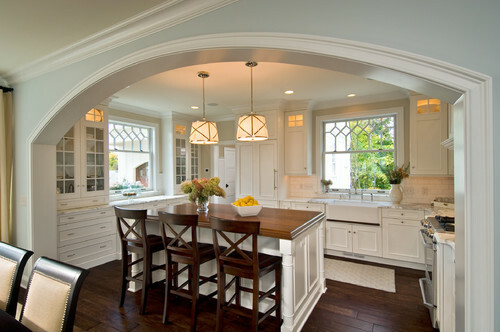 Like this kitchen above - POP! Look at how cheery that orange is against a gray & white background. This gray couch provides a great base for jewel toned accessories like rug, pillow, & lighting. 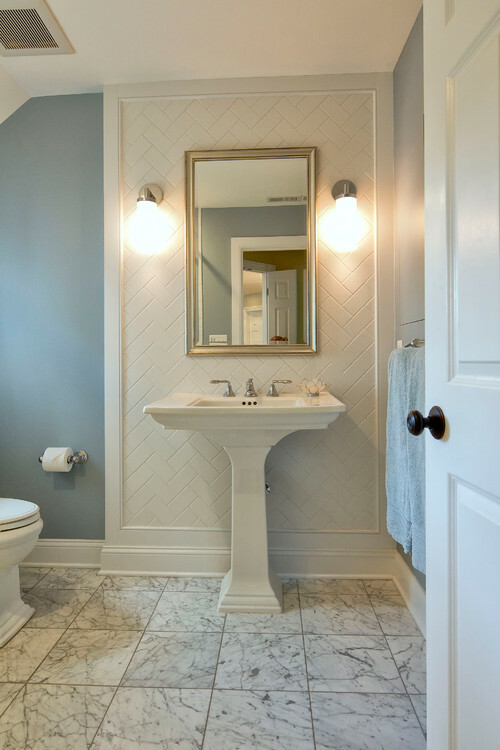 Herringbone is definitely making a statement in the design scene lately. This classic & timeless pattern has slowly been gathering speed over the years and is showing up in places everywhere from the bathroom to bedroom! While this pattern is making it's statement, another familiar is fading into the background: Chevron. Chevron has been the hyper trend of the past few years and has been applied to everything from curtains to mugs. It has been used so much that many designers are steering away from Chevron patterns going forward. If you're about to make a purchase you might want to keep that in mind! 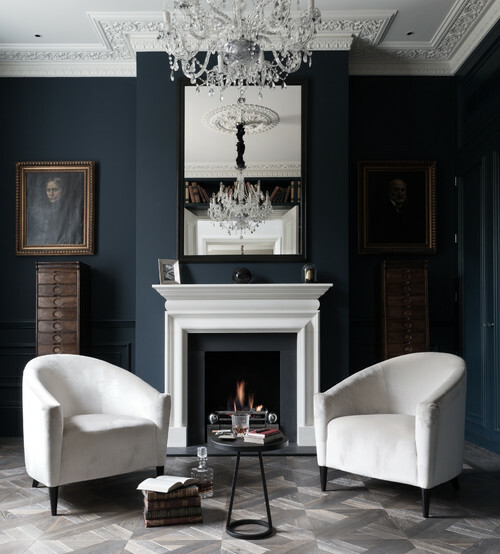 Here are a few ways that herringbone is making a classic and beautiful comeback in interiors. I've always loved the color blue, and have found navy blue in particular to be a versatile chameleon. I don't think there is a color that doesn't go with navy! There are times when I've even thought "navy is the new black" but have refrained from making such statements. Navy has been hot for a few years now and it looks classic mixed with white, like all those ginger jars we see in decor magazines today. Then I read an article from the Wall Street Journal (Top 5 Interior Design Trends for 2015) discussing how moody blues are on trend, and so I thought it would be fun to show a few combinations of navy with other colors for some inspiration. I focused mostly on painted navy rooms, although adding navy accents through furniture and accessories is another great way to infuse a smaller dose of this blue. So without further adieu let's see some pictures! Brrr... it's been pretty cold here in New Jersey! Right now it's 7 degrees, and it might get up to almost 30 by the afternoon. Although it's miserably cold, the winter is a great time to hibernate and catch up on some good books and movies indoors. And while you're inside all cozy under a blanket your eyes may wander over to that blank wall you've been meaning to decorate.... now would be the perfect time for that indoor project! Need some inspiration? There are many options for filling your walls with art. You can choose a single piece of art or large photo that you took. Another option is to create a gallery wall. The variety of gallery walls have just exploded over the years and there are many ways to create one. So below I've outline a few of my favorites with some examples of each. This style gallery wall creates a clean looking aesthetic, which makes it a good fit for traditional AND contemporary interiors. By simplifying the color palette and using similar frames you can create a uniform look. You can then create a grid with the frames for a geometric look, or can mix and match frame sizes for some variety. 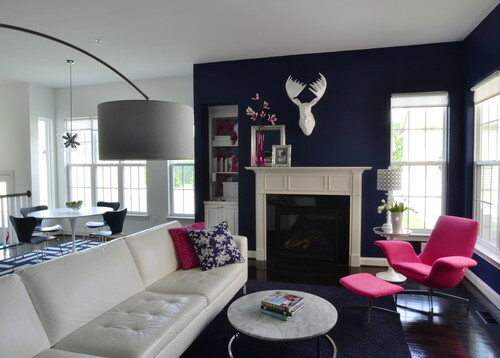 Traditional Family Room by Mississauga Interior Designers & Decorators Elizabeth Metcalfe Interiors & Design Inc.
Can't commit to just one color scheme, have to much artwork you'd like to use, or jut aren't a matchy-matchy person? Then try creating an eclectic gallery wall. Start by laying out all the pieces you'd like to use on the floor and move pieces around until they fit well together and the artwork complements others surround it. Keep in mind frame size and artwork color, you want to mix and match so the overall gallery will look well balanced. Do you have a little artist at home? You can showcase their artwork and make it feel special by using frames like these below. Happy New Year! Another year has come and gone already, where does the time go?! I always like to take the new year to reflect on where I've been, how my business has grown, and what I plan to do going forward. Last year was a productive year for me. I feel I really learned a lot and stretched beyond my comfort level while learning to handle the "business" side of my business. Being that I went to school for design I always like to joke that I have a scrappy MBA, meaning that I learn the "business" as I go along! Good thing for lots of helpful people and educational resources! This year I plan to continue last year's momentum with 3 overarching goals and 1 specific business goal. Here we go! The NKBA is a kitchen & bath association and I'm going to work towards my certification! I've really enjoyed helping clients select their finishes such as matching their countertop/ backsplash/ cabinets/ fixtures, and paint colors. I've worked on a few simple layouts and I've enjoyed using the 20/20 CAD software. So now I'm going to take this to the next level so I can take on even bigger projects! I am so excited! I think this will really be a good fit for my skill set of mixing creative design with technical specs. When things get busy priorities change and it becomes hard to stay on top of the little things like emails, mail, magazines, trade publications etc. It's easy to get swept up in the whirlwind but this year I'd really like to make it a point to go through this information as I get it. I hate piles of paperwork and sometimes you can miss out on some good opportunities or announcements! This goal certainly applies to both my personal and business life. Staying on top will help reduce clutter and keep me organized! First I am so happy to say I've rarely been late to a client appointment! But in my personal life... that's another story, I feel I'm late to everything! As I get busier I try to jam more into a day than is actually possible and so I run late. Lately I find that the stress of being late is really negatively affecting me. The good news is that it's all self inflicted! I can control my expectations for the day and manage my time by planning more realistically. It's always a work in progress but in essence this boils down to setting more realistic goals every day! All the little details make a difference and again, one of the first things to get dropped off the priority list is my own home! When I'm busy helping clients, networking, and running my business I put our home goals on the back burner. Well this year is going to change! It got to the point where putting these things off really bummed us out and became frustrating. So I've been working on plans for our home and will make sure to fit them into the agenda as well! Again this comes down to managing time and expectations. Putting limits on work and life so they each get a fair share! Let's see, what else have I been up to? I was interviewed for an article in our local paper! I gave a few tips for creating a nice comfortable guest room for the holidays and my picture was used for the entire article! Below is my picture and a link to the article. I went to an "ugly sweater" party this year for a networking event and was excited to find not only what I thought was an ugly sweater, but an ugly sweater vest!! Then I found an equally ugly turtleneck to wear underneath and bam! I was ready for the party. Much to my disappointment though.... so many people actually told me that it looked cute!! CUTE PEOPLE!!! I was like - uh, seriously?? As the designer in your network I am wearing this to an UGLY SWEATER party - and you actually think it's cute?? Oh boy... So now I ask YOU - Is this ugly or cute?!? Be honest! Well that's all for now! Let me know if you make any of the cookies I shared, and I'm curious to know your thoughts on this sweater vest! I will check in again before the year's end... which is next week already! In the meantime I wish you all the very best of the holiday season!!! You can sign up for our monthly email newsletter by clicking here!! Happy Thanksgiving everyone! I hope you all are getting ready to enjoy some time with family and friends this holiday weekend. Whether you are traveling out of town, or are running around preparing the big feast I wish you the best! Wherever you sit this holiday season you are likely to encounter a beautiful table setting. Or if you are hosting you may want to create one. There are so many beautiful ideas out there, but just where does everything actually go? I mean the basic details such as: Does the fork go on the left or right of the plate? Or as a guest if you all gather around a table filled with glasses, silverware and bread plates, which water glass is yours? At last here is a cheat sheet that easily explains it all! No more wondering how to set, or which to use! I used to waitress so I am very familiar with the "proper" way to set a table. Another tip I can give is to start from "the outside in" meaning, your dessert fork will be closest to the plate, and your salad/app fork is furthest. Enjoy! So I finally had a chance (and the motivation) to work on this little side project I had in mind for awhile. I inherited these imitation Arne Jacobson Ant Chairs awhile back and wanted to do something fun with them. They were a little scratched up so I thought of painting patterns, doing a collage, or something else altogether. Then I thought it would be really fun to apply an antique map across the entire surface! So I started shopping around and saw this nice old world map in blue on AllPosters.com. It was something a little different looking and I loved the colors together. It almost looks like a wood texture underneath the print which was a nice effect. My motivation was to complete this chair in time for the Habitat Green Event held last month. I thought it would be a fun addition to my booth as a little before & after project and I only had 3 days to work on it! So when the poster arrived I laid it out on the table to relax the curl from shipping. Now to be honest, I'd never used Mod Podge before, but it seemed like a simple yet strong adhesive to use. I watched a few YouTube videos on how to use it, then I felt ready to give it a try. First I began to gob it all over the surface of the chair and spread it around with a paint brush. Then I very carefully laid the map across the surface and rolled the brayer across the surface to get out any air bubbles. As it turns out, while I was in the middle of this time sensitive part a very large UPS delivery came to our house and due to the sheer size and weight of it, the UPS delivery man came to the side door, knocked, and offered to bring it in. I was very appreciate of his kindness, and my guard-dog Lab absolutely loves the UPS man so he was going nuts, got a few treats, and wanted to go for a ride. So... by the time I got back to the chair the Mod Podge was starting to adhere and I couldn't really adjust the map or roll out any other bubbles. In general I'm very happy with how it came out, but there is one section in the back where there is a complex curve and it didn't adhere perfectly. So now that the map has been applied to the chair it was time to very carefully cut the map to the shape of the chair. I just used a simple xacto knife with a fresh blade and followed along the edge.